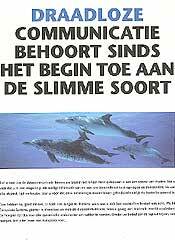 Say the word dolphin and people will echo Intelligence, Communication and Freedom. That's why 80 % of our samples broadcast at least one of these ideas. Copywriters are going out of their way to link a product to this smart animal. It's a slippery path though. We won't learn much and sometimes the attributions are dubious or downright wrong. 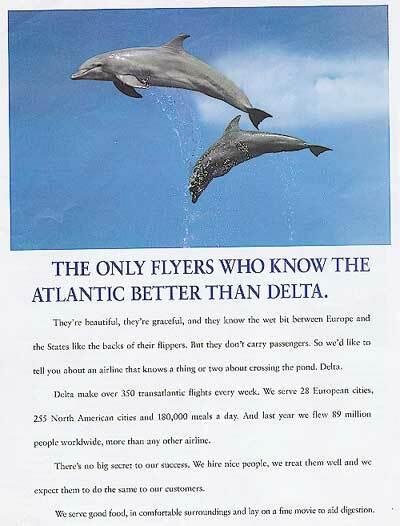 Of all species dolphins are really top of the bunch. 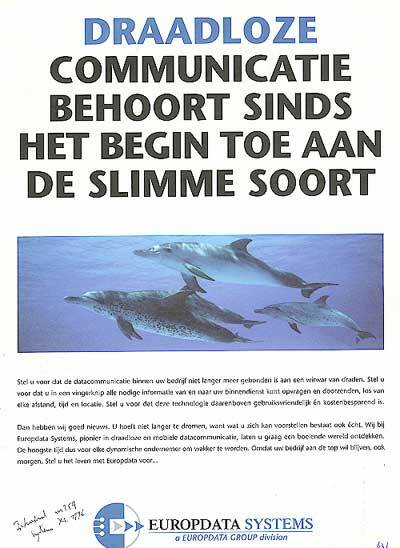 One of the things that baffles copywriters is that dolphins, thanks to their superior intelligence, have the ability of (wireless) communication (e.g. ad 1, 3) ! How do these people talk to the neighbours? Don't cats and dogs and birds and ants communicate? And do they use the telephone? Even plants are told to be able to signal things to each other. Wireless! It's my opinion that the writers are messing things up. They mistake echolocation for communication. That's something different, any bat could tell you that. Some of the texts are really a bit tortuous. Advertisement 1 is about financial planning. 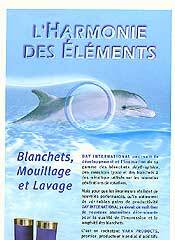 The header sounds Extraordinary innovation and is followed by The evolutionary cycle of the dolphin has bestowed upon it extraordinary intelligence and the ability to communicate. 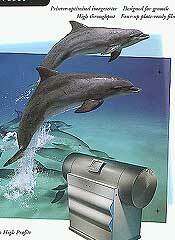 This has resulted in the dolphin being one of our most highly evolved species. Now comes the link with the service: Innovation is also a necessary requisite in financial planning ... Quite a brainteaser. 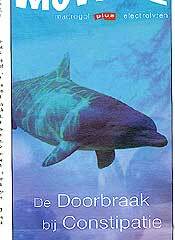 The author tries to add some weight to the advert in giving the scientific name of the animal: The Dolphin. 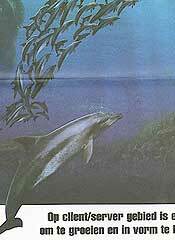 (L. Tursiops Truncatus) . That's equivalent to stating The Fish. Notice also the beginner's mistake in the scientific notation. 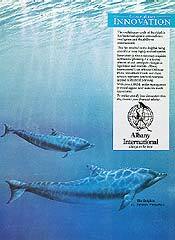 It should have been Tursiops truncatus L. meaning the Bottlenose Dolphin. 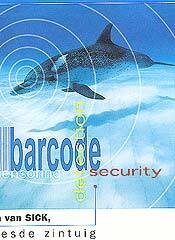 From the beginning wireless communication belongs to the clever species (3). Rather weak I think. 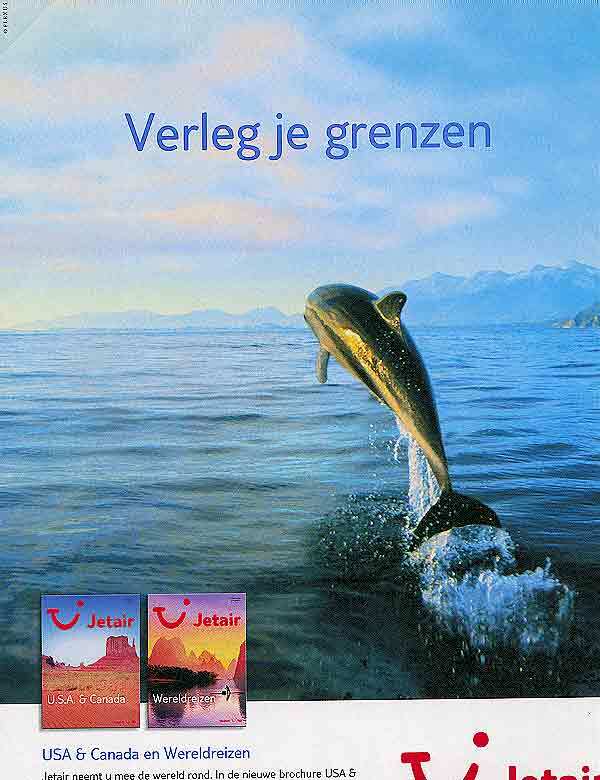 Why the species, and in the previous advert our species ? Do humans own species? Is there only one smart species? I thought humans were considered the clever kind. But wireless communication (as meant in the advertisement) is only a recent development in human history. 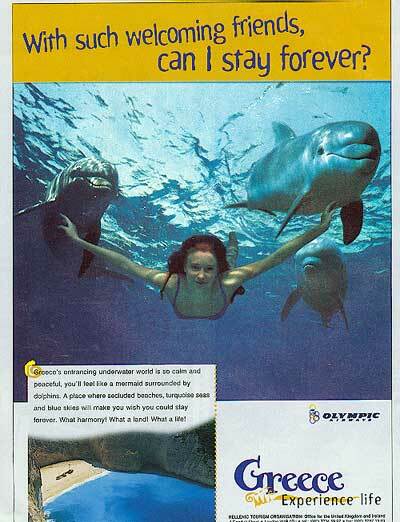 It's about the dolphin then? But scientists doubt them to be more intelligent than monkeys. Questions, questions. 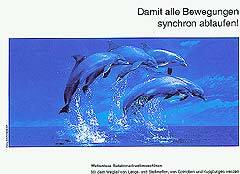 (4) 1999 - All movements synchronous. 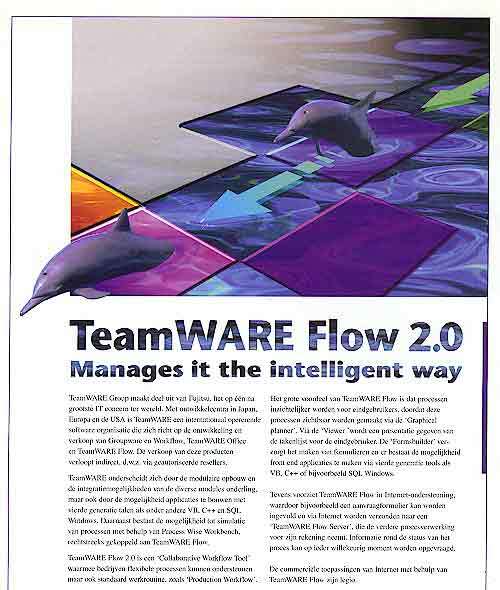 - (5) 1998 - Software which manages it the intelligent way. Like loves like says the car advert (2). 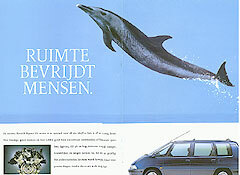 The writer stuck to the basics: dolphins are intelligent and so is this vehicle. This new car ... has an exceptionally high IQ. He's showing it with a splash. He continues with some features and then again how smart! , some more features, ingenious! , features, and many more smart stuff. 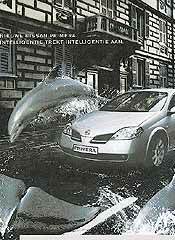 Never before existed a car this intelligent. This really is a new kind of intelligence. 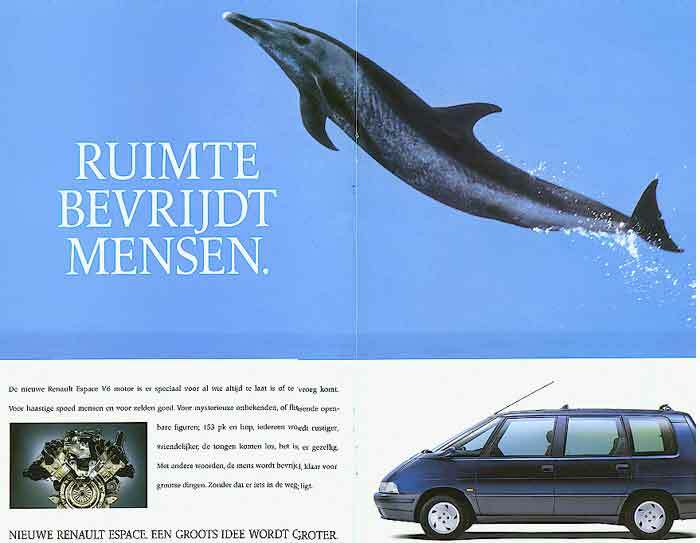 Had they consulted the USCA green book for car adverts, they would have known that dolphins are not capable of selling cars because there are no features to match. The image editing is very well done though. In modern presses it's quite a challenge to make all subsystems run fast and synchronous (4). 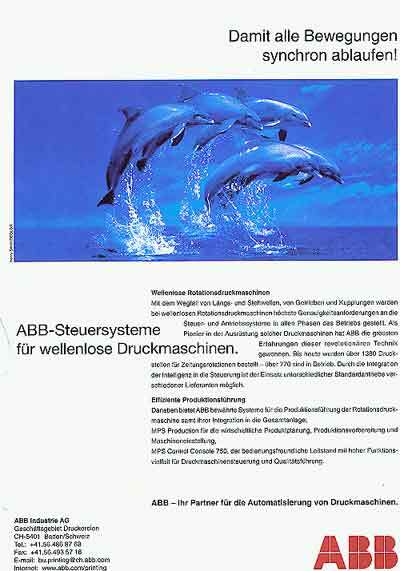 The advert for the control system achieving just that is refreshingly straightforward: the synchronous movement is shown and the intelligence is suggested by the dolphins. Working in team implies smart messaging between fellow workers (5, 9). 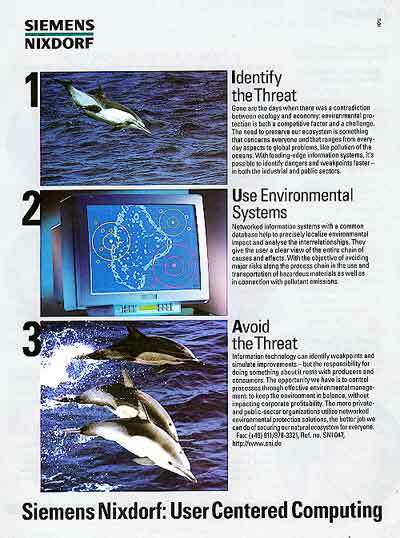 Take dolphins: no better way to illustrate the concept. 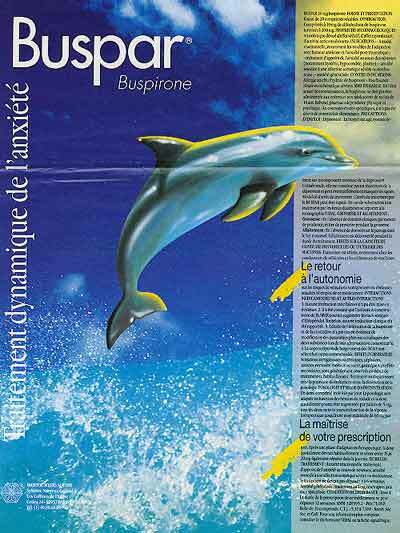 This kind of software must not impose limitations on the project at hand: it's therefore a lucky coincidence that dolphins also emanate a notion of freedom. Several other advertisements touch the same string. 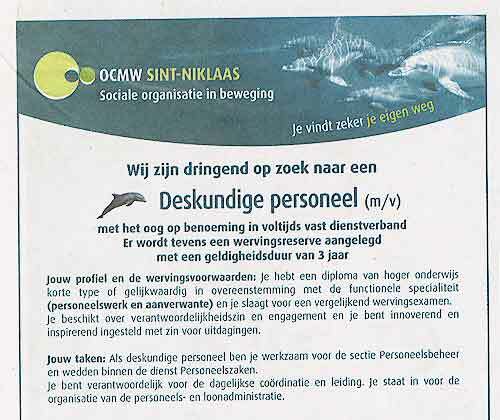 Advert 7 is a nice example: you'll work in team but still have the freedom to walk your own way. A spirit of enterprising (6) is a most interesting case. The same picture was used two times a year apart but with entirely different copy. 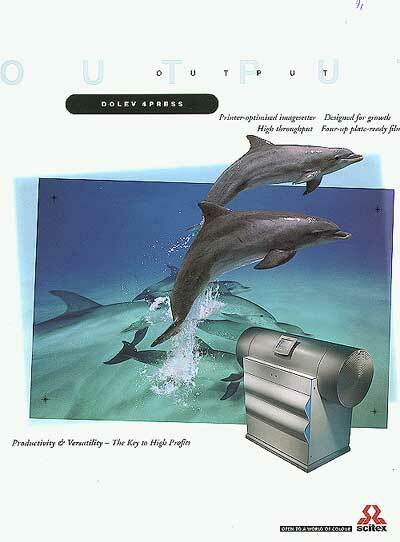 The first case is typically dolphin. The second time was probably an emergency. Could they have run out of pictures? 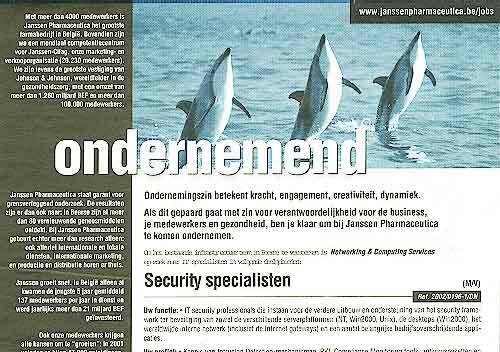 The company has a long list of job adverts featuring animals (e.g. Humpback whale). 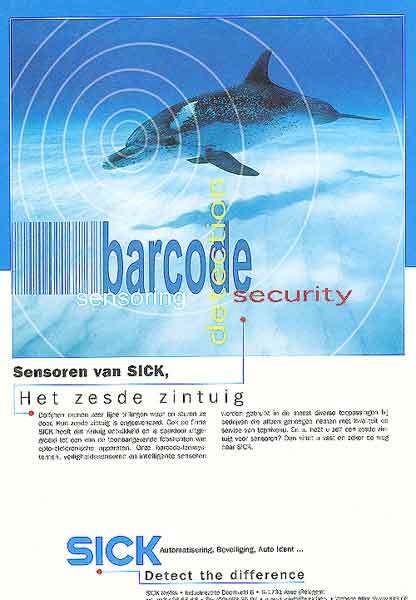 Back to echolocation with sensoring and detection in advert 8. 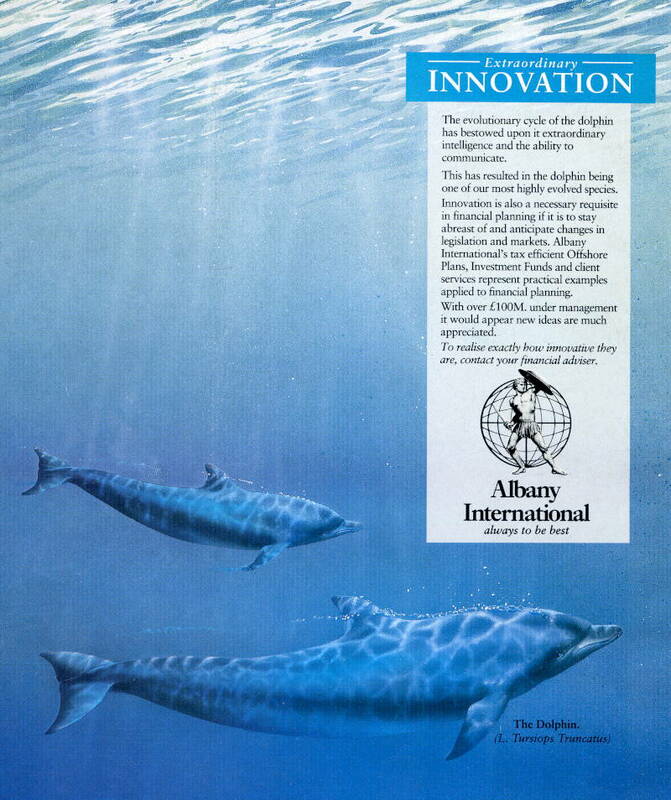 The company supplies intelligent (dolphins!) sensors of superior performance. 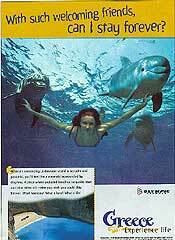 They've got the echolocation correct, but unfortunately derail with the explanation. 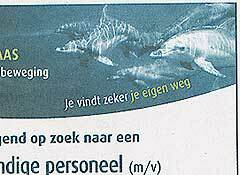 Dolphins , they say (translated from Dutch), can detect and then transmit faint oscillations. Their sixth sense is unmatched. 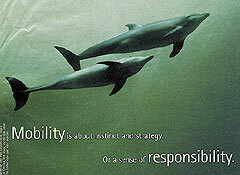 Our company has developed the same ability. ... And you, do you have a sixth sense for sensors? This sounds loud and clear as Learnt from Mother Nature, a popular song. 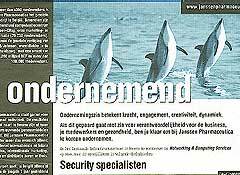 Dolphins roam the oceans and therefore, apart from intelligence and communication, Freedom is also synonymous to dolphin: physical freedom, not freedom of mind. Widen your horizon says the touroperator of example 10. 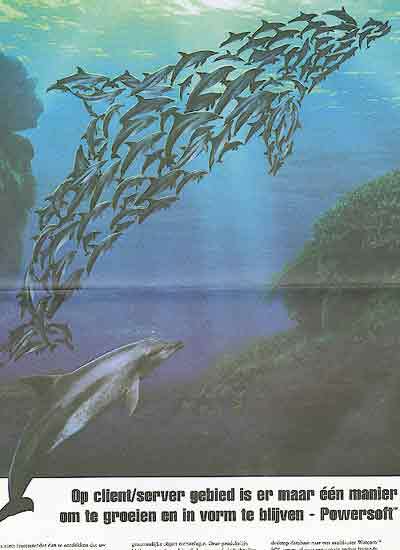 Question with this picture is what is most important: the dolphin (roaming the oceans) or the jump (escape from the usual environment)? 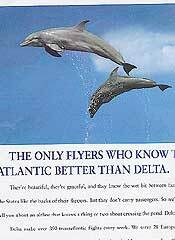 It's rather strange that companies - like this one and also adverts 15 and 16 - who are in air travel fall back to an animal living in an environment they rather wish to avoid. 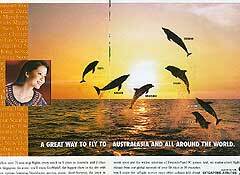 Of the three airtravel related advertisements, only 15 mentions the dolphin in the bodytext. Under the header we can read: They're beautiful, they're graceful, and they know the wet bit between Europe and the States like the back of their flippers. and then trying for a chuckle But they don't carry passengers.... One short paragraph brings back memories from before the cattle flights: We serve good food, in comfortable surroundings ... (Sigh). 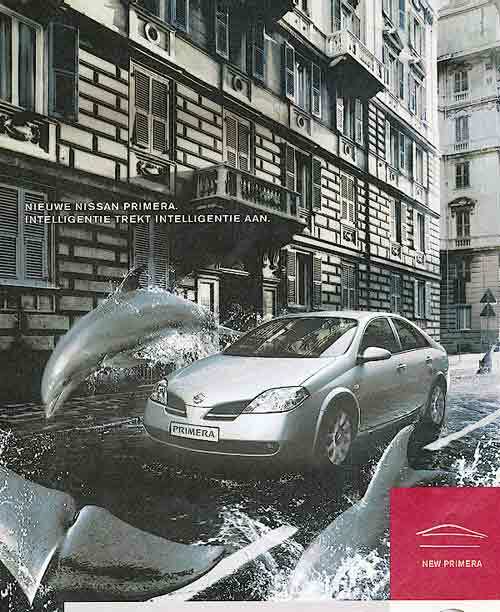 Room frees people (12) is part of a story where a penguin, a swan and a giraffe are working together in promoting a popular monovolume car. 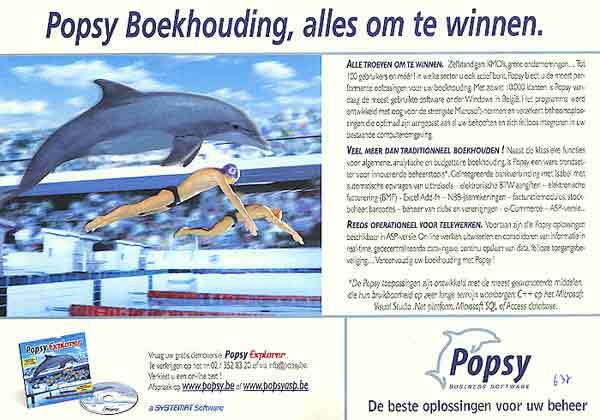 It's not obvious why a dolphin was chosen. The accompanying text gives no clue and is in fact gibberish: The new V6 engine is there specially for who's always late or arrives too early. 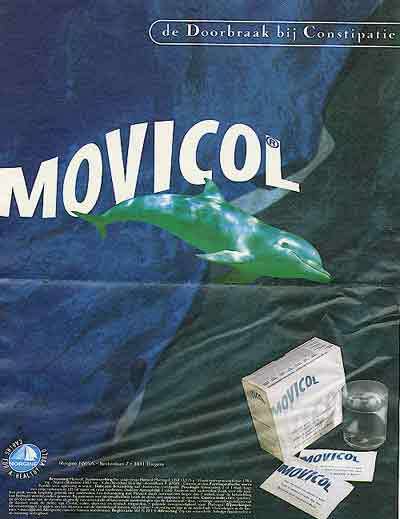 For people always in a hurry and seldom well. For mysterious strangers or flashy famous people; 153 Hp et voila, everyone calms down, behaves more friendly, the tongues are loosed, cosy atmosphere. In short: man is freed and ready for his ambitions. 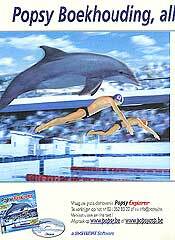 My best guess is that the dolphin stands for free movement in a borderless world, exactly what you'll get with this car. 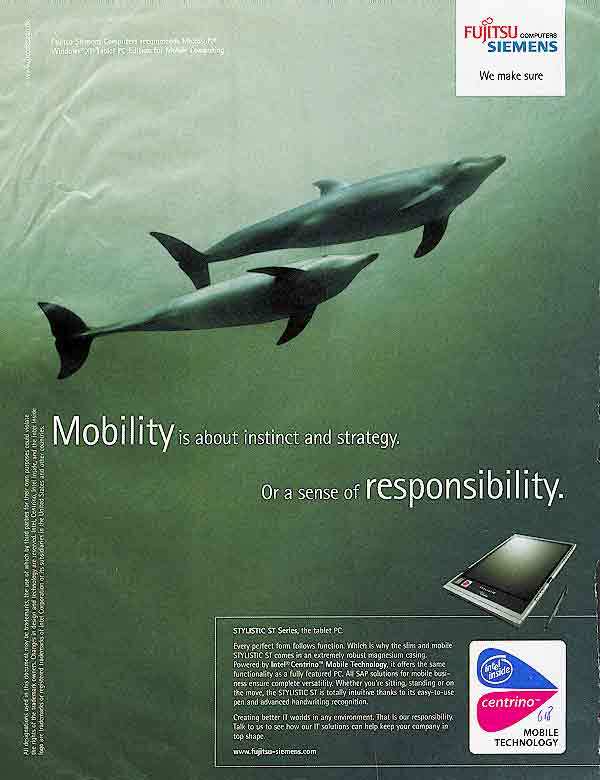 The advert for the tablet computer (11) doesn't make more sense than the car's in stating that Mobility is about instinct and strategy. Or a sense of responsibility. 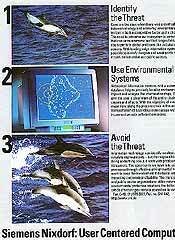 But of course it's all about the freedom (therefore dolphin) to use your pc where and when you want. (13) 1992 - Treatment of anxiety. 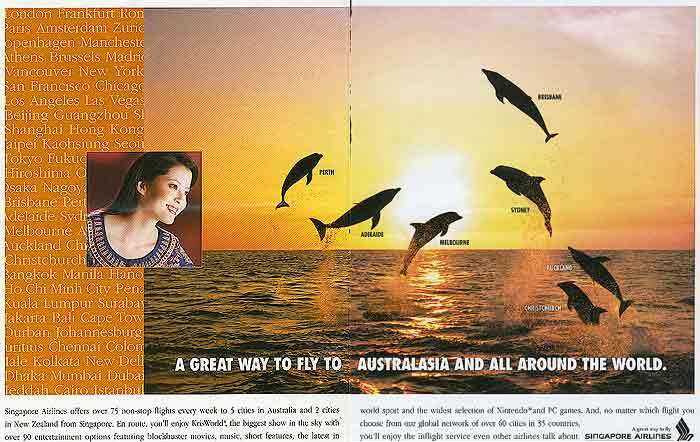 A rather more peculiar approach to freedom is shown in advert 13. With this drug people suffering of anxiety recover the ability to function autonomously between other people. 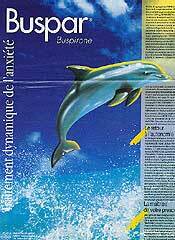 I wonder if this is also an allusion to the dolphin therapy sometimes used on people with mental disorders. 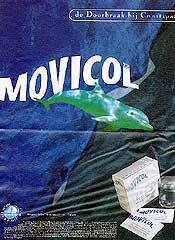 Dolphins are also used for another drug, now against constipation (ad 18, 19), but I'm clueless about the reason. 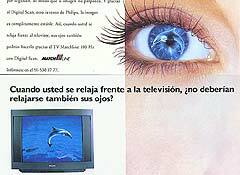 The same holds true for the television screens which won't strain your eyes (20, 21), for the printing blankets (23) and the user centered computing (22). 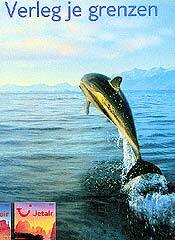 A dolphin jumping ahead is occasionally cast to play a winner. 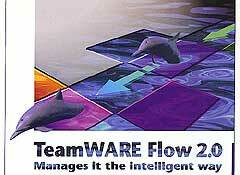 The software (16) and the imagesetter (24) both are fast and designed for growth, the best in their class. Most designers would illustrate the idea of a winner with a horse taking a hurdle. 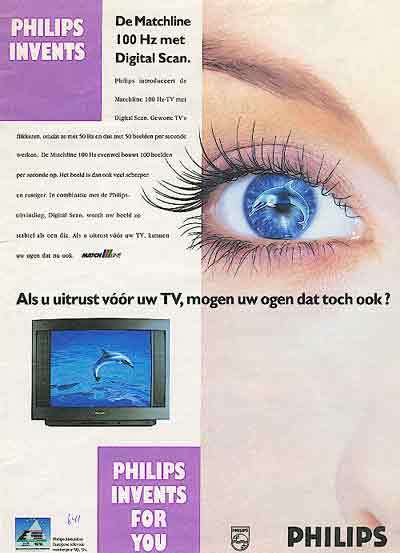 (17) 2002 - This software is a winner. 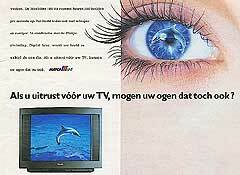 (20) 1994 - If you relax before your television (21) 1994 - why wouldn't your eyes also? 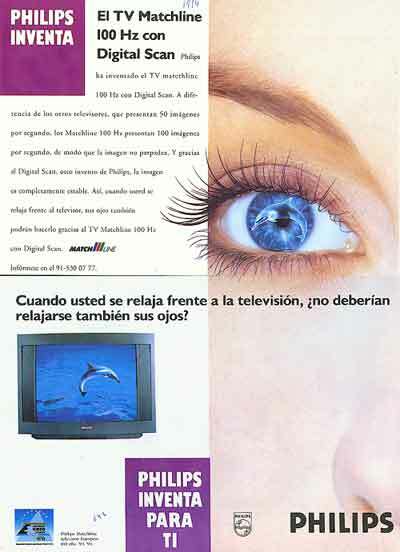 (22) 1996 - User Centered Computing.